The larimar is a variety of blue pectolite that you can only find in the Dominican Republic and in Italy. The difference with the pectolite is due to the replacement of calcium by copper which gives it this particular color. Its color varies from white to dark blue with different hues of blues. The most appreciated stones are the ones with a deep blue color. You can find some which are greenish or reddish but they are actually not used. This stone appears by the pressure of gas in the chimneys of volcanoes. The larimar is very sensitive to light and loses its color along the years. It is sometimes called the Dominican turquoise, stone of Stefilia, the stone dolphin, the blue pectolite or the stone of the Atlantis. It is the priest Miguel Domingo Fuertes de Loren who would have first noticed this stone in the Dominican Republic in 1916. He asked for an authorization to excavate a mine but it was denied to him. The authorities could not figure out which mineral he was talking about. It was not only before 1974 that the mine was found and it started to be excavated in 1976. It started with two villagers from Chupaderos who noticed the blue stone in the river and traced the course of the river to locate the mine. It was one of them who gave the name to the stone by associating a part of the name of his daughter, Larissa, with the Spanish word sea, Mar. Nowadays, the mine of the Chupaderos is divided in two mountainsides; one is governmental and the other is for the local excavation. It would help future parents to calm down and to avoid the post partum depression. 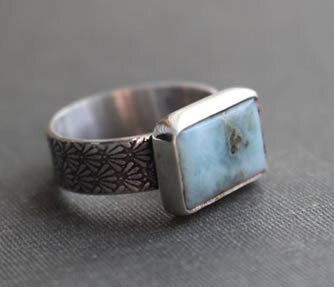 The larimar would help reduce the frequency and the intensity of flushings. It would be effective to stretch cartilages. It would relieve sore throats. 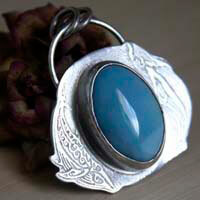 The larimar would help with a better flow in the articulations and narrowed veins by putting it on the skin. It would have properties allowing fighting against arterial hypertension and the diseases linked to stress. It would relieve from fevers, infections and inflammations. The larimar could treat skin diseases worsened by stress such as the hives, eczema and the psoriasis.